What is Genimation™? | The Genimation Group, Inc.
a great idea into reality. …that your competitors ARE NOT. Unlike other traditional marketing firm approaches, this program utilizes all your best resources (you, your staff, and the Genimation brainstorming process) to create and design a marketing program that is absolutely relative to your specific business growth & target market. Through this process, our expert facilitator will guide you and your team toward uncovering your company’s current growth barriers, marketing opportunities, and business image from the customers’ point of view, and where you want your company to be in the near future. And above all it will outline the strategic, conceptual marketing program vehicle that will get you there! will help tap into powerful implementation by using Relationship Marketing techniques, allowing you to begin to experience exponential growth like you’ve never experienced before.Our approach not only involves you in the design of your marketing program and growth strategies, but EDUCATES you and your staff towards the process of repositioning your company for long-term growth and in becoming your own Marketing Geniuses. All of this is executed and synthesized in 45 days. The key to implementing a successful marketing plan is to make sure your entire company “buys into” it, thoroughly understands your growth objectives, and ultimately follows the “program” laid out. Because the session explodes with so much powerful information, the human brain, on an average, can only retain 7%-9% of the words that it hears. Therefore, The Genimation Group produces a complete audiocassette series of your unique session. This allows you the opportunity to listen to the cassettes and reference the creative ideas produced in the session repetitively, capturing all of the profitable information that you learned. Therefore, this valuable tool should also be used to share your program with other staff members to motivate and educate them on your growth objectives.You will experience “GENIMATION”; a very potent, proven, brainstorming process used to develop an abundance of creative concepts & move you and your team forward in their thought processes very quickly and efficiently. We UNLOCK the depth of knowledge, expertise, skill, history, talent, and success of your staff and business, we articulate it in a very appealing and compelling way and then present it to your targeted market with a highly creative and powerful campaign. Outline of all the main powerful concepts and strategies invented within your session. A step-by-step sequence of each marketing strategy, complete with an in-depth explanation of the concept itself and why it should be used in your business. Action step sequence outlining your overall implementation program. Provide you with a “broad brush” step-by-step implementation process so you can understand the necessary resources you will need to implement each conceptual strategy. A listing of your target market & the buying criteria you are trying to match through this program. An outline of the profile of your target market and any subsets that may exist. Samples of extremely successful Unique Selling Propositions for you to use as a template in creating your own U.S.P. Samples of Magic Story compositions being used in the business arena right now that reposition businesses with the customer in mind through Relationship Marketing. A timeline chart that will show you when each of the strategies should be implemented. The opportunity to continue working with the Genimation Team on creating and implementing your marketing campaigns. uniqueness (tangible). As a result, your customers/clients can be “trained” to buy from you and comprehend what it is they are purchasing and its true total value. Create a marketing program that makes doing business with YOUR COMPANY easy, appealing, desirable, and even exciting for your customers! You will have, at your fingertips, several detailed concepts and techniques outlined for implementation, resulting in potential exponential growth. You will have the tools to help you impact your marketing investment for acquisition to customer re-marketing, retention, & customer nurturing programs. You will be able to create a powerful, measurable referral based system that can work like a machine in bringing you new customers. Gain the necessary knowledge and concepts behind establishing a solid, highly targeted “A” client base, nurture your “B” clients toward becoming “A’s”, while “weeding out” your “C” clients. Learn HOW and WHY you can charge more than anyone else in your marketplace and simultaneously expand your market share! Increase results in your advertising effectiveness after implementing the BONUS appendix on “Hot Advertising Tips” included in your summary! Objectives to achieve using each strategy. Spend a day with the Genimation Team! 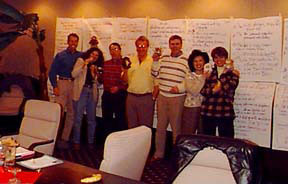 You and several of your associates or employees, in a highly productive, explosively creative, expertly facilitated brainstorming session utilizing the powerful “Genimation” process, will guide you to produce your own Unique Selling Proposition and conceptual marketing program summary with implementation steps, that will ATTRACT and KEEP your targeted “A” clients! 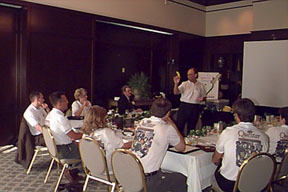 You and Your Team will Become Marketing Geniuses! Because you’re DEAD SERIOUS about producing a SUCCESSFUL marketing program and growing your business, you’ve taken this opportunity to review our GENIMATION BRAINSTORMING SESSION PROCESS. The Session will also be your new launching point for the development of your ENTIRE strategic marketing campaign that will be your tool toward moving you to your next level of success. We will travel to your office location! Call 1-800-444-4094 for more information on available dates. Now is the time to move your business to the next level.